The University of Oregon delivers a world-class education and exceptional experience to students from around the world. 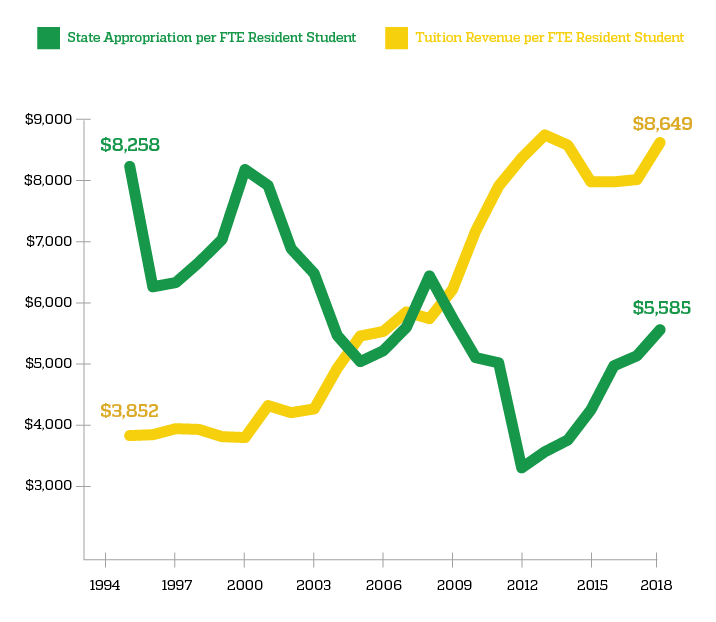 Tuition and state support are the two main sources of revenue that pay for the bulk of the university’s operating costs, including faculty and staff salaries; classrooms and libraries; academic advising, information technology, facilities, fundraising, admissions, human resources, and over $40 million in financial aid and scholarships that help ensure UO remains accessible to every qualified Oregonian who wants to attend. After much discussion, the board voted to increase tuition for nonresident undergraduate students by 2.97 percent for the upcoming academic year. Graduate tuition increases will vary by degree level and school/college, and range from no change up to 5.4% across most of the university. The increases come in the face of a projected and growing budget shortfall for the current and upcoming fiscal years. The Tuition and Fee Advisory Board — a campus body made up of students, administrators, faculty members and staff — earlier forwarded its recommended tuition changes to Schill. The increase in tuition equates to about an additional $22 per student credit hour. The UO will set resident Oregon undergraduate tuition in May, when campus officials hope to have a better sense of enrollment projections as well as the level of state financial support. University officials may not learn about the full amount of state funding until June when the Legislature concludes its current session. Without additional state support, the UO will be unable to hold resident undergraduate tuition increases at or below 5 percent and would likely be forced to look at budget cuts. The university is looking at other measures to decrease that gap, such as new revenue from campus growth and cost cutting. The board also learned from Vice President for Finance and Administration and CFO Jamie Moffitt said that the university’s projected deficit for the current fiscal year increased from $5.5 million to $7.9 million since the board’s meeting last December. While the cost of delivering a public education has only increased slightly over the last two decades when adjusted for inflation, the level of public support has declined significantly during the same time. Fundamentally, public disinvestment has shifted the burden of paying for a college education to students and families. Source: UO Office of Institutional Research. CPI-adjusted. Revenue net of remissions. Tuition is the primary funding source for the university's academic operations. *Source: Integrated Postsecondary Education Data System (IPEDS) Finance (Fiscal Year 2013-14) and Enrollment (Fiscal Year 2013-14). Full data available here. The UO strives to keep tuition increases as low as possible, but the costs of operating a world-class research institution continue to increase every year. A core part of UO's budgeting exercise is to project the future operating costs and make necessary revenue and spending adjustments. This includes investing in exceptional faculty and staff by offering fair benefits and competitive salaries, which require incremental annual increases. 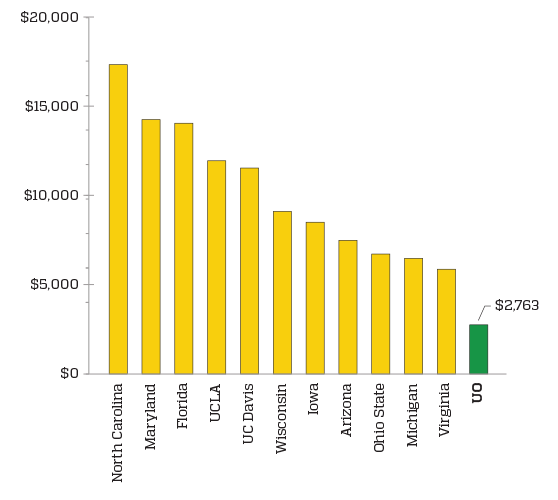 These labor costs, largely driven by collective bargaining agreements, account for more than 80 percent of expenditures yet the staffing levels at the UO still remain behind peer institutions. Surveys of staffing levels at other AAU public institutions indicate UO only has 72.5 percent of the average student-faculty ratio among peer universities and 66.6 percent of staff per student. *Projections are subject to change. Figures will be updated as data becomes available. To further promote student access and success, the UO has increased financial assistance through initiatives like its innovative PathwayOregon program, which ensures qualified, Pell-eligible Oregonians receive full tuition and fees, as well as academic support, which has helped boost the graduation rate for Pell-eligible students in the Pathway program by 13 percent. The UO has also bolstered efforts to increase the four-year graduation rate to help students save thousands of dollars on additional tuition, fees, books, and living expenses. Affordability and accessibility are vital components for achieving the university's public mission. The UO is conducting aggressive fundraising efforts and budgeting exercises to help curb institutional costs and defray the impact of tuition increases on students and families. The UO's tuition rate is determined by the UO Board of Trustees after reviewing recommendations from the administration. The Tuition and Fee Advisory Board (TFAB), a group comprised of faculty, staff, and students, reviews and discusses relevant data and budgetary information and provides recommendations to the provost on tuition rates and other costs of education. This advice and counsel is reviewed by the provost before discussing the tuition and fees structure with the president. The UO Board of Trustees is expected to consider the president's recommendation before voting in March, 2019. Members of the university community are encouraged to participate in the tuition-setting process through open forums and public comment periods. Dates and pertinent links will be published as soon as they’re available.